On Sunday I turned 50. There wasn’t too much fanfare, especially since my wife was still in the hospital that morning. However, I did get a nice card from my church and a wonderful church-lady-prepared dinner afterwards. Later that night I also got a free meal at a local restaurant, along with a unique gift sure to set me apart from the locals this winter – a set of Nordic woolen underwear (literally from Norway, not the restaurant). Today I turned 50+2, but that’s the end of looking at it that way. Today I’m letting the whole world know I am not 50 years old – I’m 25, and less. Seriously, I am a 25-year-old trapped in a 50-year-old’s body. Forget what the numbers add up to when you look at my government-issued driver’s license (for which I’ve just gone through a roll-full of red tape to renew)- I’m 25, so just affirm it. You see, even though this body of mine looks like a handsome, graying, bald man, I’m really a young man with healthy joints trapped inside. Unfortunately, no age-reversing creams or surgeries can help me look like what I really am, so you are going to have to accept me for who I choose to be – young and millennial. Even though I am only 25, there’s another me that’s trapped inside the 25-year-old me… it’s the fluid-aged me. This other me (and what’s wrong with more than one?) can get down on the floor and play with blocks, color with crayons, play with Silly Putty, and throw food at people when they aren’t looking. It’s the same me inside of me that tends to make strange noises with my body and blame it on spiders; or make other kids laugh and get in trouble with their teachers, but never own up to causing it. The me inside of the 25-year-old me varies from age to age, but that’s typically based on which toy aisle I’m visiting. So, again, I’m no longer going to simply identify as a 50-year-old man, but a bi-personage with both fixed and fluid younger ages. Those of you who rate life and health insurance should take note and lower said rates accordingly. However, should the military draft ever be re-instated, and should the 25-year-old me receive a letter, just understand that you might be putting an AR-15 in the hands of an 8-year-old, also. Being 50 on the outside does have some advantages, I suppose. Even though tomorrow (Sunday) will be my 50th birthday, I am going to resist the temptation to be self-serving; I have decided not to preach a sermon on celebrations and the giving of gifts. As a matter of fact, I even decided to avoid making the obvious connection between Pentecost and the 50th year of my life. Low-hanging fruit is too easy. No, this Sunday morning I will be continuing a series of expository sermons I’m preaching as we go through the book of Ephesians. This week we will be looking at the 4th chapter of Ephesians, concluding somewhere around verse 8. The church fellowship which will immediately follow the sermon should also be considered a run-of-the-mill time of mutual edification. After all, it’s not about me. God bless you all (or “y’all” as we say), and have a wonderful weekend and Lord’s Day! Well, it’s my birthday, and I wan’t to cry…sorta. First, I had been planning to attend a preaching conference today. It is sponsored by New Orleans Baptist Theological Seminary and is being held just outside of Atlanta. Unfortunately, I just couldn’t bring myself to get out of bed on a Saturday – on my birthday – at 5:30 a.m. and then drive. I haven’t gotten a lot of sleep in the last few days and I have a knee that’s really hurting, so it wasn’t a good morning to be hitting the road dark and early. So, I’m missing out on something I really wanted to attend. That’s sad. Secondly, my dadgum knee is killing me! Well, maybe killing is a little extreme, but it hurts to go up stairs, down stairs, use the gas peddle or brake, move it, etc. What did I do to it to make it hurt? Nothing that I know of – other than get older. Third, after I had regretfully resigned not to go to the conference and sleep in, Jack the dog – which my wife so mercifully let into our room during the night – made it very clear he needed to go outside. So much for sleeping in. Everyone else is still in bed. Wait, did I hear movement upstairs? First, I woke up, was able to get out of bed with one good knee, and made it outside where the air was fresh. I was able to make it down stairs, make my own coffee, and see and hear the falling leaves that are finally ushering in the fall season. Second, a dear blogging friend (Jessie Jeanine) is here visiting with us! Because of having to do several other things, including drive a school bus for a football game last night, I’ve been unable to take her to my favorite coffee shop here in Chattanooga, Rembrandt’s. But now that I’m not going to the conference in Atlanta, we can go get some coffee! And, you know, I have to make a good impression tomorrow, too. I asked Jessie to tell me if there were any differences between the real me and the person I convey over the internet. She replied, “Wait till after I hear you preach on Sunday.” Pressure! Incidentally, I want to thank our exchange-student-daughter, Vivian, for giving up her room for a few days and sleeping with Haley so that our guest could have a bed. However, I don’t know what German kids think about southern hospitality at this point – I think they think we’re crazy. God has been good to me, far more than I deserve – ’cause I don’t deserve anything, really. He even gave me this wonderful day at home to answer the phone, read emails and Facebook, study, drink coffee, and feed off the sympathy of others as my knee aches. Yes, happy Birthday to my middle daughter, Katie Marie! She has been two decades in this world. 20 years ago I witnessed firsthand the miracle of birth. I did not get sick, or faint, or anything like that. Actually, I held it all together, along with a 35mm camera and an 8mm handheld Sony video recorder (at least I think that’s what I used). I would describe some other things I had to do, but that’s another story entirely. My wife was wonderful through the whole process of Katie’s birth, never once insinuating anything negative regarding the marital status of my parents at the time of my birth. All she did was scream, sweat, and puuuuuuuush. I know, because I told her to. And then out came the perpetual smiler. It was Katie’s day of birth, and I remember it well…at least the parts my mind has not blocked. Katie’s 20th birthday is also a day to be reminded how old I am getting (just me; my wife doesn’t age). Twenty years ago I was in my late 20’s and had just gotten my first non-bag cell phone (an Erickson flip phone). I could touch my toes with ease, wear smaller sizes of pants, and brush my hair. Now the only hair I brush is on my face and coming out my ears. Now Katie is a beautiful young woman who drinks from a straw and rarely crawls around on the floor. These days she looks nothing like a baby elephant, but more like sunshine that blinks. She sings all the time now, too – without mentioning milk. And, fortunately, she changes her own… she dresses herself. Gooooooood Thursday, world! My apologies for not sounding like Robin Williams. There are a few things about which I will share a few thoughts. Unfortunately for me, I might not be in the best of happy moods, so this might irritate the more fragile of sensibilities. Actually, I don’t even know if I understood what I just wrote. World War III. I don’t know what you want, but I would hate to see us all go to war again. There are a lot of people out there in other countries who read this blog – having intercontinental ballistic missiles soaring over each other would not make me happy. But if war does break out between Russia and America, don’t blame me. Out-Gifting the Dad. This week was my daughter’s 18th birthday. 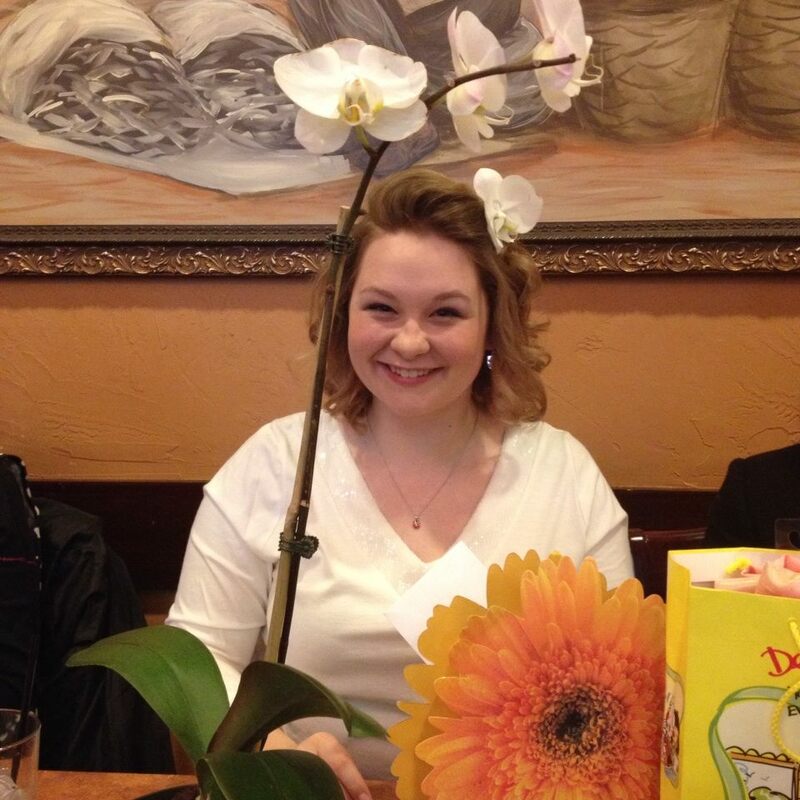 I bought her a beautiful orchid plant and gave it to her at the restaurant where we ate. When we got home, sitting on the front porch was a box, from her friend that is a boy, containing an orchid plant. I did not like the fact that he had done this, and neither did God. You see, because his had been left on the porch in 30-degree weather, they wilted. I’m soooooo sad – NOT! Music Likes. When I was on my Facebook, I noticed something strange. As you can see from a partial screen-grab, the music I “like” includes likes (pun intended) of As Isaac, Building 429, and the music I write. However, for some strange reason I am evidently Ozzie Ozbourne. It is February 13, the day after the big snow, and I’m ready to share some thoughts. I have a headache after eating Italian food (pasta fagioli) and discussing boyfriends and boundaries with one of my daughters, so I won’t make this too deep. Too much thinking could cause an aneurysm. Birthdays and age. Yesterday was my wife’s birthday, but I can’t tell you how old she is, either. Why is that? Why can’t women reveal their age? There are women who look really old, yet they’re only in their 20’s or 30’s. On the other hand, there are those like Christie Brinkley. Have you seen her? She’s 60 and still looks like she did in the Vacation movie, which is better than we can say for Chevy Chase! But my wife looks better than Brinkley in a red Ferrari, so what’s wrong with telling her age? Teenage daughters. I have ’em. I deserve an award. Defenders. Real men defend their daughters. Real dads don’t care about what the world says regarding dating and relationships – they consider all boys to be predators. You see, my daughters have boundaries, boundaries they have chosen to put in place. If I see any of those boundaries being challenged, I am likely to react in a way most disagreeable. I will defend those boundaries, even if my daughters momentarily forget where they were drawn. Respect. I have the utmost respect for a young man who respects my daughter – and her boundaries. Smart boy. Bluffing. We all have read those cute little lists like, “Rules for Dating My Daughter.” The only problem is that most girls (and their boyfriends) think their dads are bluffing. The somewhat over-the-top threats and ridiculous rules in these lists tend to contribute the sense of disbelief. However, some dads don’t bluff when it comes to their daughters. The only way to find out which ones are bluffing, and which ones are not, is to cross that line. Your true, authentic self. How do you figure out what your “true, authentic self” is? I have a suggestion or two, maybe three. First, check to see what parts of the human anatomy you do or do not have. Second, what part of the baby-making process are you most likely to be responsible for. Third, have you watched Pride and Prejudice more than once? If you check the box marked “fluid,” you’re simply an authentic pervert. Have a great weekend, my friends, and don’t forget to go to church! Not only might you find yourself getting blessed, but you could be a blessing to others, as well. Remember how I just wrote about writing for the sake of writing? Well, here we go again, but on a smaller scale. The other day I wrote a post about my wife’s grandmother’s 90th birthday. I even included some pictures. 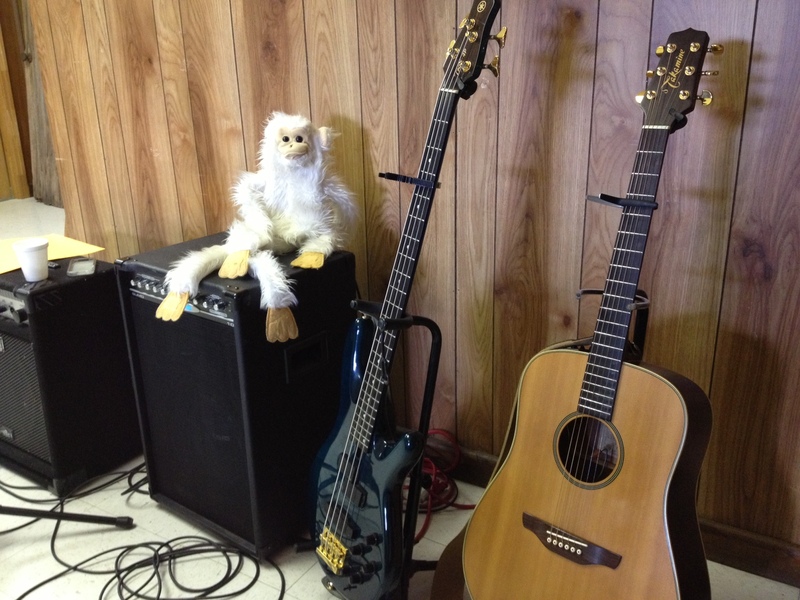 What I didn’t include was my favorite picture of the day – Mr. Monkey and the guitars. In a break between playing music and eating cake, I took this picture of Katie’s guitar and my bass, along with Mr. Monkey striking a pose. In two weeks I will be presenting my final paper to my last seminary class. Believe me, I am stressed – it’s nowhere near done! Even worse, I have to present my paper in front of a PhD with a thing for punctuation (“Have you never heard of an Oxford comma?”). OH! Guess what? My class ring just shipped today! Now, if I don’t pass, I’ll have a ring with the wrong date! Good grief!